If you remember last weeks email it walked us through some New Year Resolutions for your business! So now we are going to elaborate on each of those and how we can put it into effect. Is the space that you’re living and working in clean? Do you have everything tidied up and ready to work or live in? It goes a long way when you have a neat and tidy space because it helps clear your mind from the stress of not being able to find things where you left them. Take one hour, 30 minutes, shoot even 15 minutes if that is all you can allow and reorganize your things, throw out junk and rearrange your space if you need to. A clean room, office or space is the perfect way to start your week! Remember that this weekend! As business owners, we always have a billion things to do and sometimes we wish that we had more than twenty-four hours in a day. Well, to ease the workload, set out your weekly to-do list of the things that you need to accomplish for the week, we recommend using a planner to help guide you with this. If you aren’t a paper planner type, look into using your favorite online tool such as Google Calendar or Outlook. You want things all in one place and synched up so you can access it all easily! 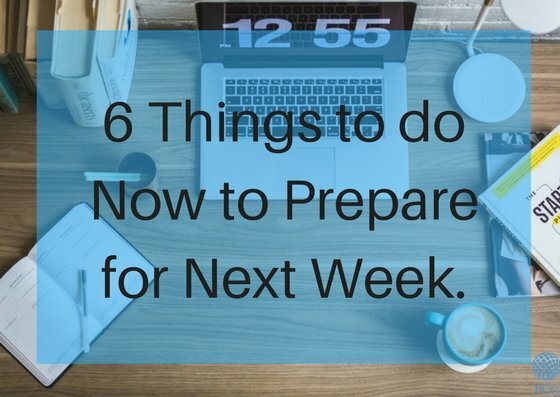 Your mind will be calmer and able to pace your workload as you go about the week because you’re not trying to rush anything or have the risk of forgetting to do things. Have you fallen off of your New Years Resolutions? We totally understand that feeling! For the next quarter of the year, focus on breaking down your big goals into small, bite-sized actions. For example, if you aim to start a website, break it down by working on one portion of your site during a short frame of time. The more you keep at it, the more you will find yourself working towards your goal. Having a goal board, or your vision wrote down is so important! They say having the visual and saying out loud to people or to have an accountability partner is the best way to make those goals happen! Besides grocery shopping, are there other things that you need to get you through the week? Sometimes, having everything you need really helps so that you’re not scrounging around for stuff. If you need new work supplies, clothes or household items, get that done and stock up on the bare necessities. It helps to buy in bulk so you can go longer in between shopping trips to handle those things. Lastly, take some time to seek ideas and inspiration, whether it’s in the form of Pinterest or watching vlogs of other people’s routines or tips for success. Sometimes, taking some time off to get inspiration may help us plan out our week differently and creatively. With the help of the internet, there are so many things and people that you can learn from! And the last but biggest tip that I have is that you need to focus on your priorities. Know what tasks are the most important ones and make sure to do those first, in case anything comes up or they take longer than others, you will know that the most important things get handled first! Pennington Consulting Group is here to help your business! Whether it’s getting organized or getting the funding you need for your business! Come check us out and give us a call today to apply!